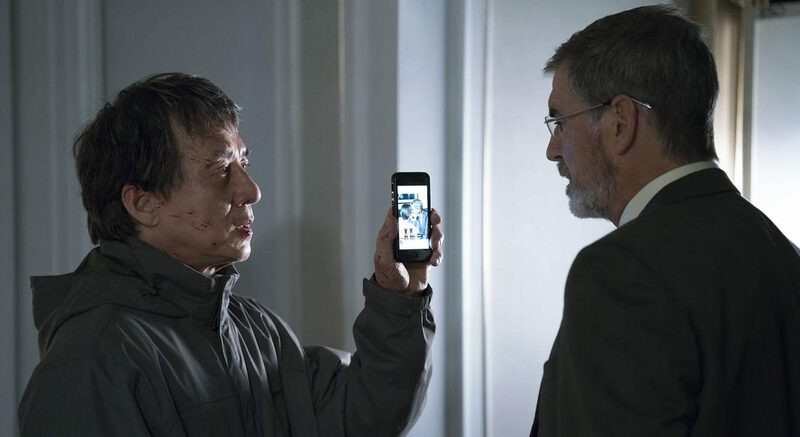 NEW YORK (CNS) — Jackie Chan takes a sharp turn from his typically genial screen personality to become the vengeful father of a London terrorist victim in “The Foreigner” (STX). In this efficiently suspenseful adaptation of Stephen Leather’s pulp thriller “The Chinaman,” director Martin Campbell and screenwriter David Marconi have produced an unembroidered drama about resurgent Irish Republican Army violence and bureaucratic treachery. There are explosions aplenty as well as displays of military survival skills and quite a few of Chan’s well-timed kicks and punches. None of the protagonist’s bombs are intended to damage anything but property, however. He’s grieving dad Ngoc Minh Quan, and he’s trying to get the attention of government officials any way he can. As a former American-trained guerrilla during the Vietnam War, moreover, he’s as adept at explosives and trap-setting as any urban terrorist. Vigilantism is always a troubling theme for believing moviegoers. So, despite his precautions — he also avoids using guns — it’s disturbing that Quan is meant to be cheered in the manner of a cowboy hero as he searches for justice. Although the story has a modern setting, the source novel, written in 1992, was published five years before the IRA’s cease-fire with the British forces in Northern Ireland. So, while Irish terrorism seems anachronistic here, the idea is that mass killings are everywhere and that a parent’s quest is universal. On the strength of his personality and the intelligence of the script, Chan also escapes any ugly stereotypes of a wily, inscrutable Asian. After his daughter Fan (Katie Leung) is murdered in a bombing that kills 19, Quan, who also lost his wife and two other daughters to Thai pirates while escaping China years before, expects to see Fan’s killers arrested through the usual channels. But Liam Hennessy (Pierce Brosnan), a deputy prime minister with substantial political ambitions, is slow to respond and uncooperative once he does. Quan then attempts to bribe a police inspector, Richard Bromley (Ray Fearon). But when that effort fails, he focuses all his energy on Hennessy, whose old ties to the IRA are as complicated as his relationships with his wife and mistress. The result is a multilayered story that, although telegraphing many plot points too soon, avoids cynicism and makes for a taut journey, albeit one with a high body count. The film contains a vigilantism theme, gun and physical violence, fleeting gore, implied sexual activity, a few profanities and frequent rough language. The Catholic News Service classification is A-III — adults. Motion Picture Association of America rating is R — restricted. Under 17 requires accompanying parent or adult guardian.